Manufacturer of a wide range of products which include cefepime hydrochloride, cefepime with l-arginine and meropenem with sodium carbonate. 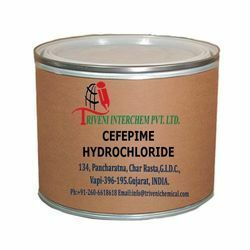 Cefepime hydrochloride 123171-59-5 Solid. It is also known as Cefepime hcl. it is use in cephalosporin antibiotics, bacterial infections Industry. Storage: Keep container tightly closed. Keep container in a cool, well-ventilated area. Waste Disposal: Waste must be disposed of in accordance with federal, state and local environmental control regulations. Cefepime with L-Arginine white powder. it is use in cephalosporin antibiotics and bacterial infections Industry.Cefepime with L-Arginine white powder. it is use in cephalosporin antibiotics and bacterial infections Industry. Meropenem with Sodium Carbonate white powder. it is use in cephalosporin antibiotics and bacterial infections Industry.Meropenem with Sodium Carbonate white powder. it is use in cephalosporin antibiotics and bacterial infections Industry. Looking for Cephalosporin Antibiotics API ?